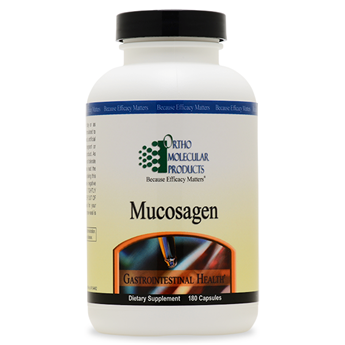 Mucosagen is a comprehensive formula designed to help support the gastrointestinal mucosal barrier health and boost detoxification pathways. Under healthy conditions, the gastrointestinal (GI) tract contains a semipermeable epithelial mucosal barrier which protects against the unwanted passage of food antigens, toxins, and microorganisms from crossing directly into the bloodstream. Several factors can affect the integrity of the epithelial barrier including medications (particularly NSAIDs) non-steroidal anti-inflammatory drugs), stress, alcohol intake, injury, trauma, microbial imbalance and poor nutrition. Reducing the impact of these factors and preserving a healthy GI tract is critical for maintaining long term health. Mucosagen is a comprehensive formula designed to help support barrier function of the gastrointestinal GI lining. The mucosal epithelium serves multiple purposes including allowing nutrients from the diet to be absorbed and digested while simultaneously serving as a barrier that protects against unwanted food particles, toxins and microorganisms from passing directly into the body. Mucosagen includes a synergistic blend of ingredients that support the health of the GI lining while promoting inflammatory balance and liver detoxification pathways to support overall health.